Before getting on to this week’s topic, I must address the fact that in last week’s post I had alluded to a continuation of the same topic but from an attraction-based viewpoint. I tried very hard to compose such a post, but I was unable to create a post that made any sense to me, and I think I need to learn more about attraction-based conceptions of physical reality before attempting such a task again. I’d like to thank TheTaoOfD for liking last week’s post, and I’d like to apologize to TheTaoOfD and all Hagsaeng Naebu blog fans for not being able to finish my thoughts about perception at this time. In it’s place, I would like to share some other thoughts I have that I believe relate to mental aspects of martial arts as well as everyday life. Thank you for your patience, everyone. And now, on to Science! Sometimes when I share with others my thoughts on life and reality, they look at me almost in disgust and claim that my thoughts are “a little out there” for them. That’s fine with me; I understand that. Thinking against the grain and building a life and worldview that 99% of other people don’t understand and disagree with is a scary thing, and most people don’t want to travel that road less taken. Their views are grounded in contemporary-conventional Western science which presents a cold, static, and well defined material world based on fact – and this dominates much of the Western world view. This “scientific” world view seems to instantly go against many of the spiritual suppositions of martial arts. However, if one were to really get into some of what contemporary-conventional Western science has to teach us, one might find that the seemingly well-defined material order this scientific world view presents isn’t really so easy to define nor is even that material. It’s easy to observe the physical world and gain concrete understanding . . . right? In martial arts and other schools of alternative world views, concepts exist that posit that one has a deep and underlying connection to the world and all things in it, and the world and all things in it has a deep and underlying connection to the individual one. Beautiful understandings can arise from this sort of concept such as Gandhi’s famous statement, “if one man gains spiritually the whole world gains with him, and if one man falls the world falls to that extent.” Most people admire such sentiment in the collective experience of all humankind but cannot accept that such a cosmic connection actually exists between the world and all its inhabitants. Those in doubt should consider the following. It is perhaps natural to believe that we are all isolated individuals living separate lives removed from all other things. After all, one has one’s own body visually appears separate from other bodies and other things. We seem to move about this world on our own coming and going as we please from individual place to individual place. It all seems so separate and distinct. Who are we? What are we made of? Contemporary-conventional science might say that we are made of matter, right? What’s matter made of? Protons, neutrons, and electrons right? Electrons are pretty darn important seeing as they hold together all the chemical bonds that make up our physical bodies. Without electrons, we couldn’t be any bigger than a single atom. Where are our electrons from and how did we get them? Electrons are not exactly found “in” chemical bonds. Electrons exist in a cloud of possibility: the possibility being their location. Electrons are more likely to be certain places, but could be in many places. In fact, an atom’s cloud of electron possibility extends out infinitely in all directions; while an electron is much more likely to be currently located closer to the atom it is associated with, an electron could be anywhere – even the other side of the world. The majority of your electrons are located close to your body, but you have some electron density at 10 feet away from your body, at 100 feet away from your body, at 10,000 feet away from your body, at the other side of the world, and even at the other side of the galaxy. The importance of understanding the full implications of electron possibility clouds cannot be overstated. Now it goes with out saying that your electron density is pretty low at the other side of the galaxy, but that’s not the point! The point is that YOU have and electron density at THE OTHER SIDE OF THE GALAXY, and THE OTHER SIDE OF THE GALAXY has an electron density in YOU. Everything between you and there has an electron density in you and you in it. And electrons rarely stay associated with a certain chemical bond for long and readily hop around such that bonds are continuously changing electrons which means that we are continually swapping electrons with the environment around us and its members. We daily exchange electrons with the people we meet, the places we see, and the items we interact with; we are DAILY exchanging electrons with things ALL OVER THE WORLD. Electron possibility clouds show that our electrons, a fundamental part of what composes our bodies, exists not just in our bodies but in all things. The electrons of our bodies routinely trade with the electrons of other bodies and things so that the electrons that hold together our bodies are electrons that were perhaps moments ago associated with some other body or some other thing, and the electrons that hold together other bodies and other things are electrons that were previously our electrons; our bodies’ electrons help hold the world together and the world’s electrons help hold our bodies together. Does a fundamental and underlying connection with all things really seem like that much of a stretch when considering how far and wide everything’s electrons are? I don’t think so. On the surface, contemporary-conventional science may seem to be against “out there” spiritual views, but things are not always what they appear to be on the surface. This is an amazing world in which we live, and the in-depth study of its physical nature will doubtlessly point towards its amazing cosmic nature. Miracles can seem commonplace: like those inter-galactic electrons that have been part of you all this time but still felt so normal. 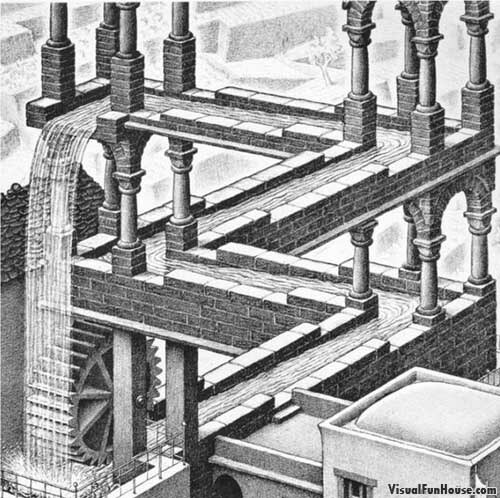 Postscript: All the images in this post are pieces by M. C. Escher. The last piece is one he entitled “Humanity” which I thought was rather extra appropriate for this post on top of the already relevant image it contained.